I got my first ever Nfu Oh polishes in the post last week. All holographics. One thing I don't like about Nfu Oh polishes is that they are not named. This silver holo is called #61. These are quite runny polishes and application is tricky. You have to make sure you don't wipe over the same place twice or else you will get bald patches. Also make sure you let it totally dry before applying additional coats. This was three coats, without a top coat. It dries rather matte too. I thought I would do a quick silver holo comparison. The first pic is an indoors pic of the holos, which are from left to right - Nfu Oh #61, China Glaze OMG, Colour Club Worth the Risque, China Glaze Sexagon. Nfu Oh #61, China Glaze OMG, Colour Club Worth the Risque, China Glaze Sexagon. As you can see, Nfu Oh is by far the most holo of the silver holos I have. One last note on the Nfu Oh - the wear was terrible, it was peeling off and chipping by the end of the first day, but the colour and holo-ness is totally worth the effort. Wow i never realized how different they were. I like China Glaze Sexagon the best. Evil Angel - glad you liked it. Chantal - I got them here in oz through vivid nails online. I think it's the only place you can them here. But it appears they have jacked up the price now - $30.50 a bottle OMGWTF! Lolitadewdrop - It'a really hard to pick a fav. I love Sexagon too, its such a different sort of holo. Yikes, that's steep! 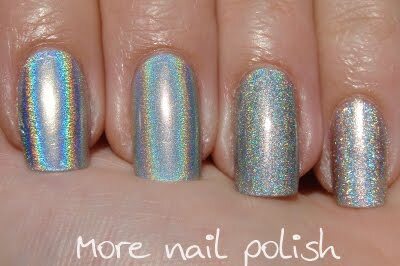 But it's a pretty awesome holo. Thanks for the tip. DROOL!! i love this!! did you happen to use the aqua base coat for the nfu oh 61? tmcdonnell90 - No aqua base, not on these photos. Although I do have it now! What is the deal with the ridiculous prices for polish in AU?? $30.50 for a bottle of polish?? 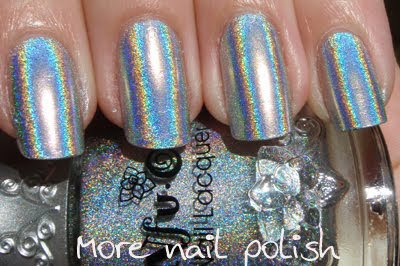 I ordered this same polish from fabuloustreet.com for $12.50 plus shipping.